Perhaps to edge out Chrome and Android browsers? On the heals of Apple's iOS 6 release and a host of Windows Phone 8 device announcements, rumor has it Samsung is hiring WebKit developers to create its own mobile browser for Android Galaxy devices. WebKit is the open source browser engine behind Apple's Safari and Google's Chrome browsers. The report comes from the Korean website IT Times, which claims that Samsung's U.S. R&D center in Silicon Valley recently hired WebKit devs to begin work on a Samsung mobile browser. If the reports can be believed, then the Samsung browser will be designed to compete directly with mobile Chrome. Google's Chrome browser debuted on mobile devices in February, and has since become a popular choice for both Android and iOS users. By July, Chrome had reached 1.5 percent adoption with iOS users, an impressive feat considering how long those users have relied on Safari alone. Chrome is more advanced than the default Android browser, and Samsung's rumored browser will have to step things up even further if it wants to compete. As CNET pointed out, a Samsung-branded browser, if powerful enough, could help differentiate Samsung's Galaxy devices from other Android handsets. In response to a TechRadar query, a Samsung representative reminded us that the company doesn't comment on rumors or speculation. That said, the Samsung rep informed us that this is the first he'd heard of a Samsung mobile browser, so take that as you will. Globally, Opera is the most-used mobile browser, according to StatCounter, a global online statistics firm. According to the StatCounter site, Opera also barely beats Android's browser and "iPhone," which could mean Safari. Reports claim that most users of web-capable phones simply use their devices' default browsers, and Opera has come pre-installed on various phones from Samsung, Motorola, HTC, Nokia, Sony, and more. With modern browsers like Chrome mobile coming packed with features, including the ability to switch rather seamlessly between desktop and mobile browsing experiences, Samsung had better have some aces up its sleeves if it wants to stand out. 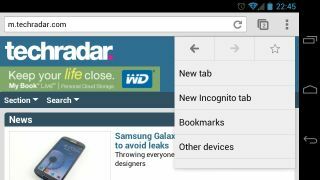 For more, check out TechRadar's comparison of eight Android browsers' speed and features.